When trying to create a warm relaxing feeling adding luxury with a touch of elegance, there is nothing better than including a solid wood furniture piece into the room. You’re probably thinking that wood is too plain or boring but on the contrary, these are great natural warm pieces that could help add some life into your interior. Let’s start by adding a solid wood TV cabinet for your family room. Finding the right pedestal for your TV isn’t always easy but here at Decor8 Hong Kong furniture, we would like to introduce the Frederick Solid Oak TV Cabinet and Media Console to you. Wooden cabinets like these are quite common evoking a timeless look, with rich wood tones, and a solid natural appearance. So why use wood and not anything else? Using solid wood is perfect because it is a strong material that is able to support a large television on top. 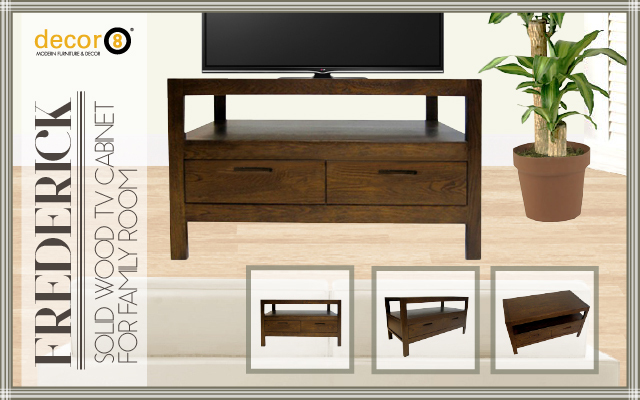 So what sets the Frederick TV Cabinet apart from the others in our Decor8 furniture collection? Unlike most of our other TV Cabinets, this one actually comes in three available colour finishes. There is the natural oak finish which goes great with other light wood pieces in the room. The oiled walnut finish which is a stained walnut finish using natural plant based wood oils featuring a textured finish. Finally we also have the painted walnut finish which is a smooth finish with a stunning luxury look and feel to it. Width wise, this TV cabinet is one of the ones that takes up the least space measuring at 140 cm. Though it is quite high measuring at 75 cm which is similar in height of a bar table. It features both open space and closed space storage, which is desired amongst some people who like to show some of their electronics but hide others that aren’t often used. There is no time like the present and the wonderful Frederick TV Cabinet could be yours with a click of a button. This entry was posted in Storage, TV Cabinets and Side Boards and tagged natural wood, oak, solid wood, solid wood storage, tv cabinet, tv cabinet hong kong, tv console, tv stand, walnut.